Last night I made the kids rice bags laced with dried lavendar and essential oils. 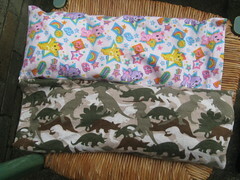 They are both made out of flannel fabrics which make them even more comforting. Perfect timing with winter’s arrival in full force today both in temperature and wetness. Tonight I have a date with some fairy fabric. 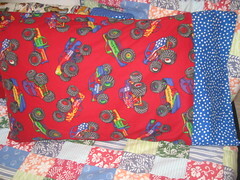 Yesterday I posted about Rhys’ monster truck pillowcases. Here is a photo of Sloan’s Carebear version. The fabric is flannel and so perfect for us heading straight for winter. 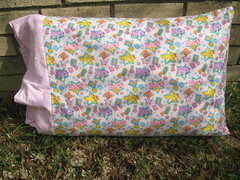 She also loves them and I find it such a rewarding sewing project. They are quick, simple and a crowd pleaser. I always dread this change of season. Winter seems to plague us with sickness most the season which is always a challenge at the best of times. We are in our pioneer style rental house where the wind whistles through and freezes us in winter. We have light at the end of the tunnel with our house framing up and the roof going on this week. Hopefully the progress on our building will start flying by. Unfortunately, we will be here in the freezing house for the duration of the season. I packed up the summer wardrobe this week. I am going to change my handbag to my winter black one next and tonight’s project is some flannel rice bags for the kids to try and keep them warm and toasty this winter. This is my way of trying to stay positive about the change of season. Embracing with my small hugs. We are back from our holiday and slowly getting the house, routine, and kids back on track. We had a lovely trip and the kids were outstanding considering we dragged them halfway around the world. I bought a lot of fabric on our travels. My son has fallen in love with anything to do with monster trucks. Why on earth he found this topic to grasp onto? Who knows! I found this very loud and proud monster truck fabric at JoAnns and it had to come home with us. Rhys is over the moon and I can’t help but try and remember Randy Pauch and his last lecture which I was lucky enough to watch one day on Oprah. He said his parents let him paint his room’s walls and express himself. I hope this lets my little guy embrace his passion and I am just going to let go what the esthetics look like. My quilt class starts back next Wednesday so I am trying to sneak in these fun little projects that have been bubbling away in my head.